University of Lynchburg’s Daura Gallery is publishing the first comprehensive collection of art by local artist Queena Stovall. 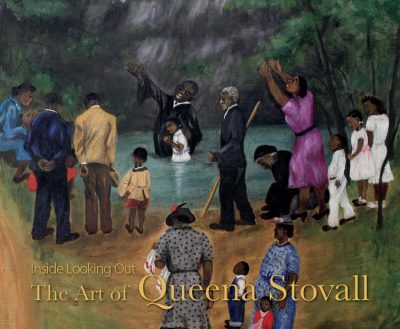 Dr. Barbara Rothermel, Daura Gallery director, and Ellen Agnew compiled and wrote Inside Looking Out: The Art of Queena Stovall in conjunction with the exhibit of the same name, which Agnew curated and which is on display in the Daura Gallery this semester. The Daura Gallery also is sponsoring a historic highway marker honoring Stovall. Emma Serena Dillard Stovall, better known by the nickname “Queena,” was a native of Amherst County, Virginia, known for painting colorful scenes from rural life: funerals, farm auctions, berry picking, hog killing, wood cutting, etc. She started painting at age 62 and was largely self-taught. Some have called her “Virginia’s Grandma Moses.” Stovall died in 1980 and most of her paintings are in private collections. A book-signing and reception will be held from 5 to 7 p.m. Thursday, March 22, in the Daura Gallery. The public is invited and admission is free. The book will be available for purchase at the gallery. The cost is $40, cash or check only. The highway marker honoring Stovall will be dedicated at 4 p.m. Saturday, March 24, near Stovall’s home, “The Wigwam,” on Elon Road (Va. 130) in Madison Heights. A reception will follow at the Ruritan Club, located nearby at 2120 Elon Road. The public is welcome and admission is free. In applying for the highway marker with the Virginia Department of Historic Resources, Dr. Rothermel sought the expertise of Jane Baber White, former director of Lynchburg’s Old City Cemetery. White is a strong supporter of local history projects, among them numerous historical highway markers and the Anne Spencer House and Garden Museum in the Pierce Street Renaissance Historic District. The Stovall exhibit includes 44 paintings gathered from private collections and museums throughout the country, including the Fenimore Art Museum in New York, the Virginia Museum of Fine Arts, the Maier Museum of Art, and the Museums of Oglebay Institute in Wheeling, West Virginia. Seven paintings are from the permanent collection of the Daura Gallery, which has exhibited Stovall’s work in the past. The exhibit will be in the Daura Gallery through Friday, April 13. After being closed for spring break from March 3 to 11, Daura Gallery will resume normal hours (9 a.m. to 4 p.m., Monday through Friday) and also observe special Sunday hours for the Stovall exhibit several weekends, including 1 to 5 p.m. on March 11 and 1 to 4 p.m. March 18 and 25 and April 8. Admission is free.